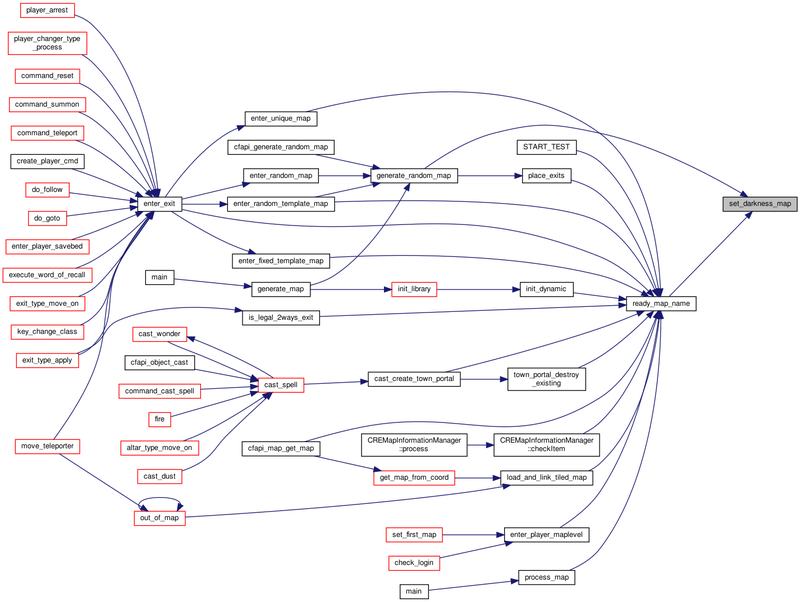 This program generates map browsing web pages. Quick run: without arguments, will make sensible choices. For help, try the -help option. the world map, with elevation information. Since this program browses maps from the first map, only maps linked from there will be processed. Maps are generated as the server sees them, that is with weather effects, treasures instead of markers, and things like that. For maps, 2 pictures are generated, one real size and one small-size. Three maps are generated for the world: raw world map, world map with region information, region information only. Maps are always sorted, by the map name (part after the last /). Files are generated based on templates, where tags are replaced by their runtime value. map_no_exit.template: template to use when no exit on the map. map_with_exit.template: template to use when there are exits on the map. map_exit.template: template to use for each exit on the map. map_lore: template to use to insert the map's lore. map_no_lore: template when no lore for the map. map_no_quest.template: when the map is linked to no quest. map_with_quests.template: the map is linked to at least one quest. map_no_monster: used when no monster on map. map_monster_before: applied before the monster list. map_monster_one: one monster on the map. map_monster_between: added after each monster except the last. 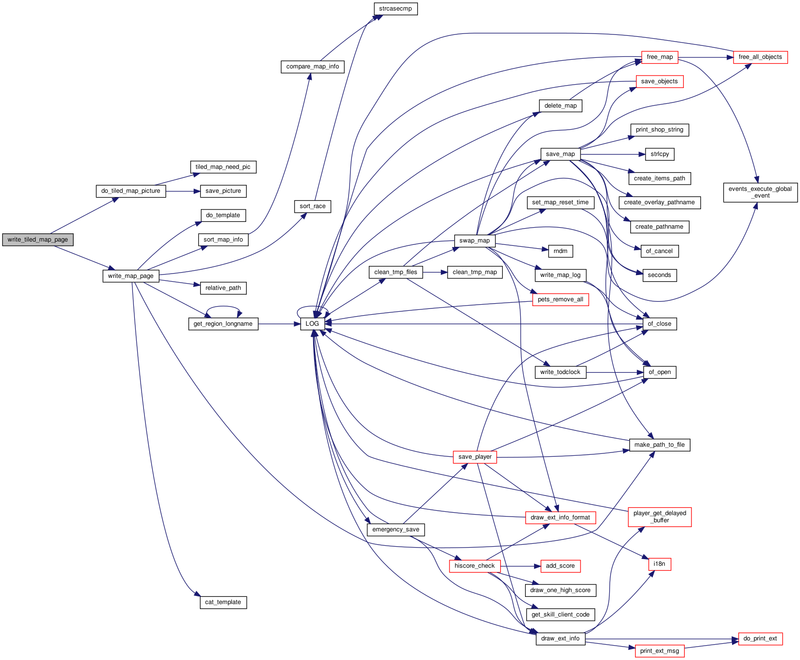 map_monster_after: added after the last monster in the list. world_row.template: one row of world maps. world_map.template: one map in the template. index_region_region.template: one region in the index. level.template: index of maps by level. level_map.template: one map in the level. quests_map.template: one map in a quest. MAPPATH: full path to currently generated file. MAPNAME: name of the map (part of the path after last /). MAPPIC: name of full-size pic of the map. MAPSMALLPIC: name of reduced-size pic of the map. MAPEXIT: text generated by map_with_exit or map_no_exit. INDEXPATH: path to index.html file. REGIONPATH: path to region's file. REGIONNAME: name of map's region. REGIONINDEXPATH: path to region index file. WORLDMAPPATH: path to world map file. MAPLEVEL: level as defined in the map. MINMONSTER and MAXMONSTER: minimum and maximum level of monsters on the map. tags for map, except MAPEXIT. EXIT: text generated by the map exits. EXITNAME: name of exit (part of the path after /). EXITPATH: relative path of exit's page. QUESTS: result of map_one_quest processing. PATH: path to the quest page from the index. TEXT: text associated to the map about the quest. MAPCOUNT: count of maps in region. LETTERS: text generated by region_letter processing. MAPPATH: relative path of the map from the map's root. MAPHTML: relative path of HTML file for map. MAPS: text generated by world_row processing. WORLDMAP: path to world map picture, with regions information. WORLDRAW: path to raw world map, without regions information. WORLDREGIONS: path to world map picture containing only regions information. MAPS: text generated by world_map processing. MAPPATH: relative path of the map's generated page. MAPLEFT, MAPTOP, MAPRIGHT, MAPBOTTOM: coordinates (in pixels) of current map in full world map. LETTERS: text generated by index_letter processing. tags of index, except LETTERS. MAPS: text generated by index_letter processing. LETTER: letter being processed, uppercase. LETTERCOUNT: number of maps for current letter. REGIONCOUNT: total number of regions. REGIONS: text generated by index_region_region processing. REGIONFILE: relative path to region page. COUNT: count of different levels. LEVELS: result of the sub-level templates. MAPS: result of the level maps templates. MAPNAME: name of the map. MAPPATH: relative path of the map from the index. QUESTID: unique quest identifier, anchor to index page. MAINMAPPATH: path to the map defining the quest. MAINMAPNAME: name of the map defining the quest. MAPPATH: path to the map. Definition at line 491 of file mapper.c. Referenced by add_slaying(), and write_slaying_info(). Definition at line 489 of file mapper.c. Definition at line 490 of file mapper.c. Definition at line 487 of file mapper.c. Definition at line 488 of file mapper.c. Definition at line 492 of file mapper.c. One special item (weapon, shield, ...). Link between a quest and a map. List of NPCs with a custom message. One monster race in the maps. Definition at line 428 of file mapper.c. Adds a map to specified array, if it isn't already. list list to add to. will allocate memory and update variables when required. Definition at line 1530 of file mapper.c. References struct_map_list::allocated, struct_map_list::count, and struct_map_list::maps. Referenced by add_map_to_region(), add_map_to_slaying(), add_monster(), add_one_item(), create_tiled_map(), do_parameters(), fix_exits_for_map(), fix_exits_to_tiled_maps(), fix_tiled_map_monsters(), get_map_info(), init_map_list(), merge_tiled_maps(), CREMapInformationManager::process(), and process_map(). Links a map to a quest. description associated link description. Must not be NULL. Definition at line 1258 of file mapper.c. References add_to_struct_map_in_quest_list(), struct_map_in_quest::description, get_quest_info(), struct_map_in_quest::map, struct_quest::maps, struct_map_in_quest::quest, struct_map_info::quests, and strdup(). Links a map to a region. Will not readd the map if already linked. reg region to link the map to. Definition at line 1676 of file mapper.c. References add_map(), struct_region_info::is_world, struct_map_info::path, struct_region_info::reg, region_allocated, region_count, struct_region_info::sum, struct_region_info::sum_x, struct_region_info::sum_y, struct_npc_info::x, and struct_npc_info::y. Adds the specified map to the slaying information if not already present. info structure to add to. item one of the S_xxx values specifying what type of slaying this is. Definition at line 1809 of file mapper.c. Adds a monster to the monster list. monster monster to add. Can be any part. map map to add the monster to. Definition at line 740 of file mapper.c. References add_map(), add_race_to_list(), get_race(), obj::head, obj::level, MAX, struct_map_info::max_monster, MIN, struct_map_info::min_monster, struct_map_info::monsters, obj::name, and struct_race::origin. Add the specified NPC to the list. list where to add the NPC. npc NPC to add. Must have a name and message. Definition at line 1508 of file mapper.c. References struct_npc_list::allocated, struct_npc_list::count, create_npc_info(), and struct_npc_list::npc. Adds an item to the list of special items. map map it is on. merge items with the same properties. Definition at line 602 of file mapper.c. References add_map(), obj::arch, arch_to_object(), obj::artifact, calc_item_power(), struct_equipment::calc_power, struct_equipment::diff, ensure_unique(), find_artifact(), FLAG_IDENTIFIED, FLAG_UNPAID, free_equipment(), FREE_OBJ_FREE_INVENTORY, FREE_OBJ_NO_DESTROY_CALLBACK, get_equipment(), get_ob_diff(), give_artifact_abilities(), artifactstruct::item, obj::item_power, llevError, LOG(), struct_npc_info::name, struct_equipment::name, obj::name, obj::name_pl, obj::nrof, object_free2(), object_give_identified_properties(), struct_equipment::origin, struct_equipment::power, QUERY_FLAG, SET_FLAG, strdup(), stringbuffer_finish(), stringbuffer_new(), obj::type, struct_npc_info::x, obj::x, struct_npc_info::y, and obj::y.
Appends a race to a race list. check if 0, don't check if race is already on the list ; else don't make duplicated entries. Definition at line 346 of file mapper.c. References struct_race_list::allocated, struct_race_list::count, and struct_race_list::races. Referenced by add_monster(), fix_tiled_map_monsters(), and get_race(). Creates a link between two maps if they are on different regions. linkname name of the link as it should appear. Unused. Definition at line 1726 of file mapper.c. References get_region_by_map(), regiondef::name, regions_link, regions_link_allocated, regions_link_count, snprintf, and strdup(). 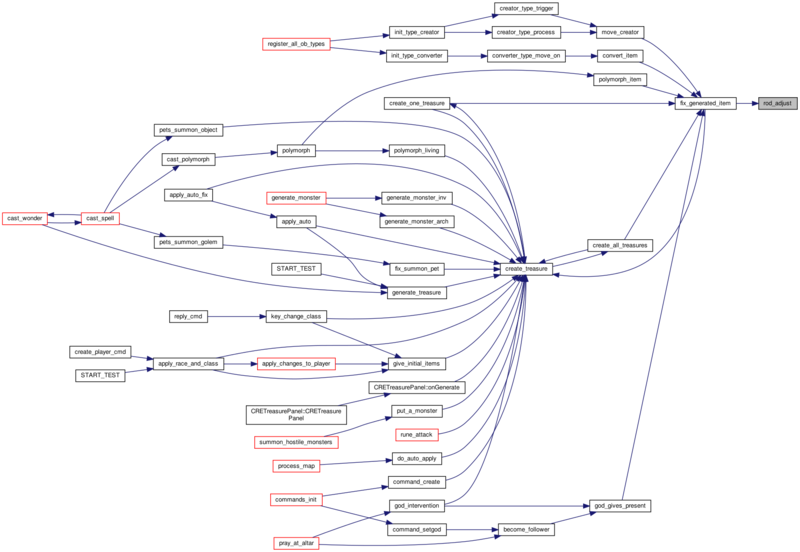 Referenced by CREMapInformationManager::process(), and process_map(). Adds the item's information to the map. map map containing the item. item item which slaying field we're considering. Definition at line 1821 of file mapper.c. References add_map_to_slaying(), CONTAINER, get_slaying_struct(), LOCKED_DOOR, S_CONNECT, S_CONTAINER, S_DOOR, S_KEY, obj::slaying, SPECIAL_KEY, and obj::type. Referenced by check_slaying_inventory(), and process_map(). Definition at line 1210 of file mapper.c. References struct_map_in_quest_list::allocated, struct_map_in_quest_list::count, and struct_map_in_quest_list::list. Map was just loaded, handle op's initialization. Generates shop floor's item, and treasures. 1 if object was initialized, 0 else. 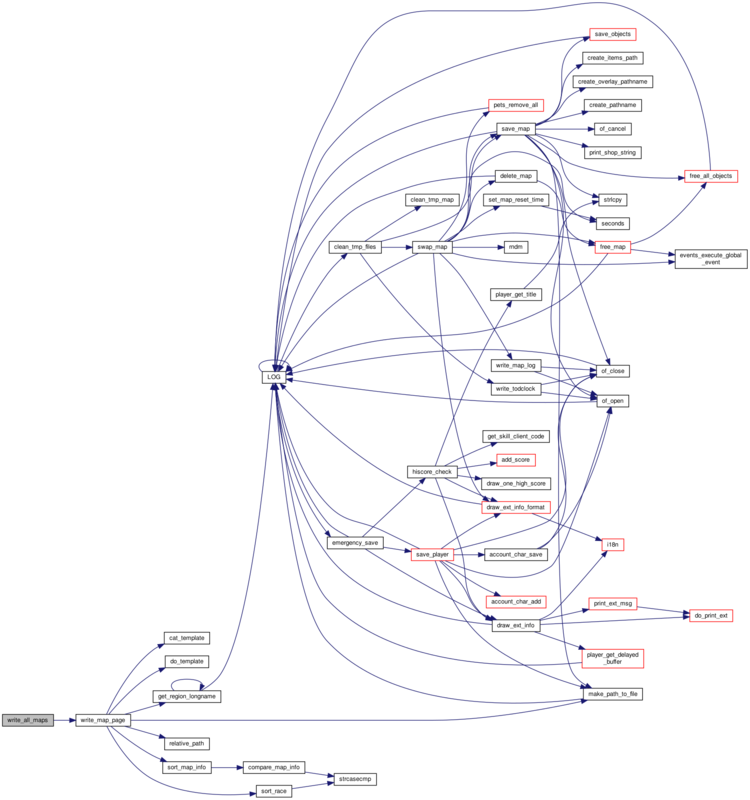 Definition at line 3992 of file mapper.c. References BOOK, CLEAR_FLAG, create_treasure(), mapdef::difficulty, obj::env, liv::exp, FLAG_AUTO_APPLY, FLAG_CURSED, FLAG_DAMNED, FLAG_IS_A_TEMPLATE, FLAG_UNPAID, FOR_INV_FINISH, FOR_INV_PREPARE, generate_treasure(), HAS_RANDOM_ITEMS, liv::hp, identify(), obj::map, MAX, object_free_drop_inventory(), object_insert_in_map_at(), object_insert_in_ob(), object_remove(), QUERY_FLAG, obj::randomitems, SET_FLAG, SHOP_FLOOR, obj::stats, TREASURE, obj::type, obj::x, and obj::y. Go through the entire map (only the first time when an original map is loaded) and performs special actions for certain objects (most initialization of chests and creation of treasures and stuff). Calls apply_auto() if appropriate. Definition at line 4044 of file mapper.c. 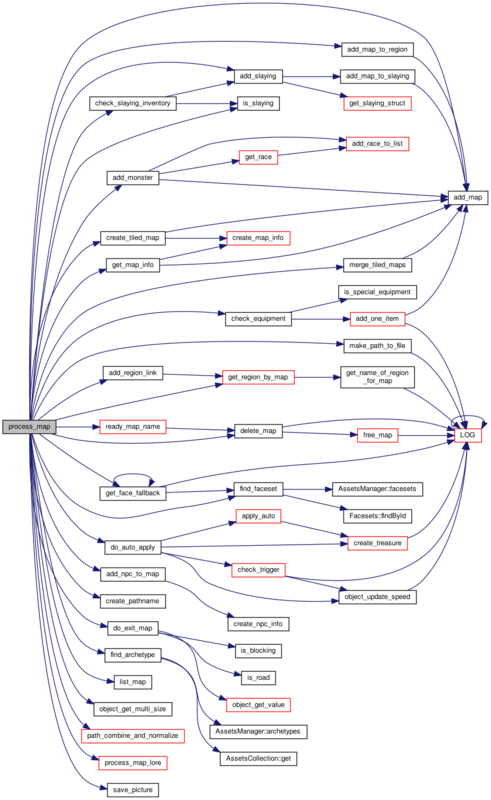 Referenced by enter_unique_map(), generate_random_map(), mapfile_load(), and START_TEST(). Concatenates a string, and free concatenated string. source string to append to. Can be NULL. add string that is appened. Will be free()d after. Must not be NULL. new string that should be free()d by caller. Definition at line 908 of file mapper.c. Referenced by do_map_index(), write_map_page(), write_maps_by_level(), write_quests_page(), write_region_index(), and write_world_map(). Checks if item and its inventory are worthy to be listed. map map the item is on. Definition at line 676 of file mapper.c. References add_one_item(), FOR_INV_FINISH, FOR_INV_PREPARE, and is_special_equipment(). Recursively checks if the object should be considered for slaying information. map map containing the items. item item to consider. Must not be NULL. Definition at line 1847 of file mapper.c. References add_slaying(), FOR_INV_FINISH, FOR_INV_PREPARE, and is_slaying(). Definition at line 3953 of file mapper.c. Referenced by fatal(), and LOG(). Compares struct_map_info according to the map name or the path if equal. comparison on name, and if equal then on whole path. Definition at line 1114 of file mapper.c. References struct_map_info::name, struct_map_info::path, strcasecmp(), and struct_map_info::tiled_group. 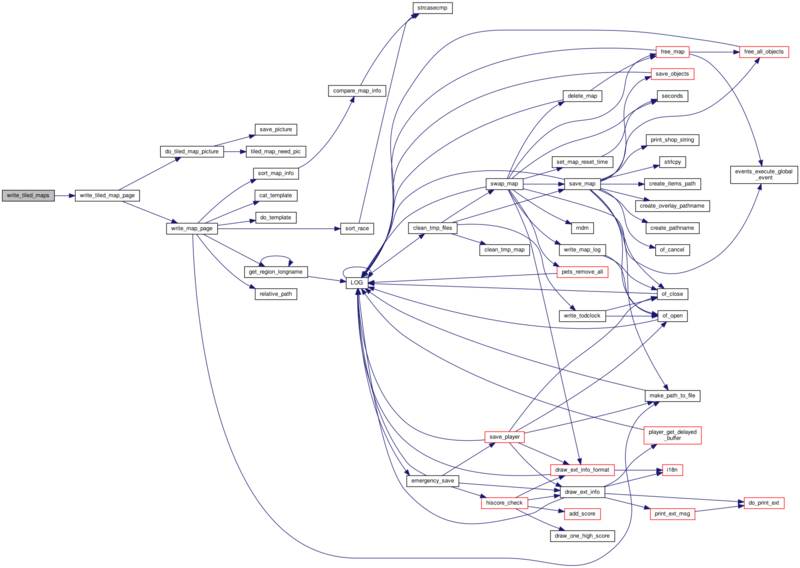 Referenced by sort_map_info(), and sort_map_info_by_level(). Definition at line 3631 of file mapper.c. Definition at line 1551 of file mapper.c. References struct_map_info::exits_from, struct_map_info::exits_to, init_map_list(), init_npc_list(), init_race_list(), init_struct_map_in_quest_list(), struct_map_info::min_monster, struct_map_info::monsters, struct_map_info::npcs, struct_map_info::quests, struct_map_info::readable, struct_map_info::tiled_group, and struct_map_info::tiled_maps. Referenced by create_tiled_map(), and get_map_info(). Create the struct_npc_info from the specified NPC. It must have a name and message. npc NPC to gather info for. Definition at line 1490 of file mapper.c. References struct_npc_info::message, obj::msg, struct_npc_info::name, obj::name, strdup(), struct_npc_info::x, obj::x, struct_npc_info::y, and obj::y. Create a new tiled map and link it to the tiled map list. Definition at line 1573 of file mapper.c. Sets the main map for a quest. mainmap main map to associate. description quest description. Must not be NULL. Definition at line 1310 of file mapper.c. References struct_quest::description, get_quest_info(), struct_quest::mainmap, struct_quest::name, struct_map_info::path, and strdup(). Definition at line 3833 of file mapper.c. References ALTAR, apply_auto(), check_trigger(), CLASS, CONTAINER, create_treasure(), mapdef::difficulty, FIREWALL, FLAG_AUTO_APPLY, FLAG_IS_LINKED, FOR_INV_FINISH, FOR_INV_PREPARE, FOR_MAP_FINISH, FOR_MAP_PREPARE, HAS_RANDOM_ITEMS, HEAD, MAP_HEIGHT, MAP_WIDTH, object_update_speed(), PLAYER, PLAYER_CHANGER, POTION, QUERY_FLAG, ROD, SCROLL, SPELL, SPELLBOOK, TIMED_GATE, TREASURE, TRIGGER_BUTTON, TRIGGER_PEDESTAL, WAND, struct_npc_info::x, and struct_npc_info::y.
Referenced by do_exit_map(), and process_map(). Proceses exit / road / blocking information for specified map into the global infomap map. If map isn't a world map, won't do anything. map map to write info for. Definition at line 840 of file mapper.c. References color_blocking, color_linked_exit, color_road, color_slowing, color_unlinked_exit, do_auto_apply(), elevation_info, elevation_max, elevation_min, EXIT, FOR_MAP_FINISH, FOR_MAP_PREPARE, HEAD, infomap, is_blocking(), is_road(), MAP_HEIGHT, MAP_WIDTH, MAX, MIN, obj::move_slow, object_get_value(), mapdef::path, obj::slaying, TELEPORTER, obj::type, struct_npc_info::x, and struct_npc_info::y. Prints usage information, and exit. 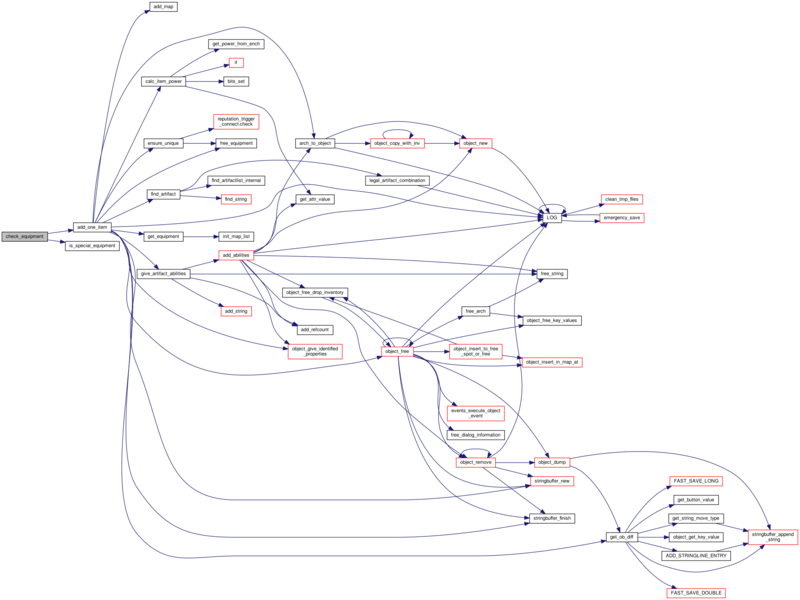 Definition at line 3530 of file mapper.c. Creates the page for a map index. dest path relative to root where the index will be located, without leading /. Used to compute the map's path relative to the index. maps_list maps in the index. template_letter template for one letter of the index. template_map template for one map. vars template variables to give access to. processed template. Should be free() by the caller. Definition at line 2132 of file mapper.c. References cat_template(), struct_map_list::count, do_template(), generate_index, struct_map_list::maps, struct_map_info::name, struct_map_info::path, relative_path(), snprintf, sort_map_info(), strdup(), struct_map_info::tiled_group, tolower, and VARSADD. Referenced by write_maps_index(), and write_region_page(). argc number of parameters, including program name. argv arguments, including program name. Definition at line 3563 of file mapper.c. References add_map(), do_help(), do_regions_link, force_pics, generate_index, generate_pics, get_map_info(), jpeg_quality, list_unused_maps, map_limit, OF_JPG, output_format, rawmaps, root, show_maps, snprintf, tileset, warn_no_path, world_exit_info, and world_map. Variables in the form #VARIABLE# will be substituted for specified values. vars variables to replace. Array must be NULL-terminated. values variables to replace by. Must be the same size as vars, no NULL element allowed. filled-in template, that must be free()d be caller. NULL if memory allocation error. returned string will be a memory block larger than required, for performance reasons. Definition at line 979 of file mapper.c. Generates the large and small pictures for a tiled map. This uses the large/small pictures made during process_map(), so having a map limit could lead to maps not found and invalid results. map tiled map to make the picture of. add a field to struct_map_info to remember if pic was updated or not, and update the tiled map only if one map has changed / the pic doesn't exist. Definition at line 2901 of file mapper.c. References struct_map_list::count, generate_pics, struct_map_info::height, struct_map_list::maps, struct_map_info::name, OF_PNG, output_extensions, output_format, struct_map_info::path, struct_map_info::processed, root, save_picture(), size_small, snprintf, tiled_map_need_pic(), struct_map_info::tiled_maps, struct_map_info::tiled_x_from, struct_map_info::tiled_y_from, struct_map_info::tiles, and struct_map_info::width. Definition at line 3959 of file mapper.c. Dummy functions to link the library. Definition at line 3931 of file mapper.c. Referenced by adj_stealchance(), adjust_sign_msg(), alchemy_failure_effect(), animate_weapon(), apply_builder_floor(), apply_builder_item(), apply_builder_remove(), apply_builder_wall(), apply_builder_window(), apply_by_living(), apply_check_apply_restrictions(), apply_check_item_power(), apply_check_owner(), apply_manual(), apply_map_builder(), apply_sign(), apply_special(), armour_improver_type_apply(), attack_hth(), attack_melee_weapon(), attack_message(), attack_ob_simple(), attempt_do_alchemy(), attempt_jump(), attempt_recipe(), attempt_steal(), basic_emote(), blocked_link(), book_type_apply(), can_pay(), cast_bless(), cast_cause_disease(), cast_change_ability(), cast_change_map_lightlevel(), cast_cone(), cast_consecrate(), cast_create_food(), cast_create_obj(), cast_create_town_portal(), cast_curse(), cast_heal(), cast_identify(), cast_invisible(), cast_item_curse_or_curse(), cast_light(), cast_raise_dead_spell(), cast_smite_spell(), cast_spell(), cast_transfer(), cast_word_of_recall(), cf_handle_type_apply(), cfapi_player_message(), change_abil(), change_spell(), charge_mana_effect(), check_login(), check_name(), check_pick(), command_abil(), command_addexp(), command_afk(), command_arrest(), command_banish(), command_body(), command_bowmode(), command_brace(), command_create(), command_diff(), command_drop(), command_dropall(), command_dump(), command_dumpbelow(), command_empty(), command_fire(), command_follow(), command_forget_spell(), command_free(), command_freeze(), command_goto(), command_gsay(), command_help(), command_insert_into(), command_inventory(), command_invisible(), command_kill_pets(), command_language(), command_learn_spell_or_prayer(), command_loadplugin(), command_loadtest(), command_lock_item(), command_mark(), command_mon_aggr(), command_nowiz(), command_overlay_reset(), command_overlay_save(), command_party(), command_passwd(), command_patch(), command_peaceful(), command_pickup(), command_possess(), command_purge_quest(), command_purge_quest_definitions(), command_quest(), command_quit(), command_remove(), command_rename_item(), command_reply(), command_reset(), command_resistances(), command_rskill(), command_run(), command_save(), command_search_items(), command_setgod(), command_settings(), command_showpets(), command_shutdown(), command_sound(), command_stack_clear(), command_stack_list(), command_statistics(), command_stats(), command_strings(), command_style_map_info(), command_summon(), command_take(), command_teleport(), command_tell_all(), command_throw(), command_title(), command_toggle_shout(), command_unloadplugin(), command_use(), command_uskill(), command_whereabouts(), command_wizcast(), command_wizpass(), confuse_living(), create_aura(), create_bomb(), cure_disease(), current_map_info(), dimension_door(), dispel_rune(), display_motd(), display_new_pickup(), display_who_entry(), dm_stack_peek(), dm_stack_pop(), dm_stack_push(), do_hidden_move(), do_skill(), do_skill_attack(), do_tell(), do_throw(), do_turn(), do_wizard_dm(), do_wizard_hide(), dragon_ability_gain(), dragon_eat_flesh(), drain_specific_stat(), drop(), drop_object(), eat_special_food(), emergency_save(), enter_map(), examine(), examine_monster(), execute_word_of_recall(), exit_type_apply(), exit_type_move_on(), find_or_create_connection_for_map(), find_traps(), fire(), fire_arch_from_position(), fire_bow(), fire_misc_object(), food_type_apply(), get_other_player_from_name(), god_enchants_weapon(), god_intervention(), god_removes_curse(), handle_newcs_player(), help_topics(), hide(), hiscore_check(), hiscore_display(), hole_type_move_on(), identify_altar_type_move_on(), improve_armour(), improve_weapon(), improve_weapon_magic(), improve_weapon_stat(), infect_object(), inscribe_scroll_cmd(), inventory(), jump(), key_change_class(), key_confirm_quit(), key_roll_stat(), kill_object(), kill_player(), kill_player_not_permadeath(), kill_player_permadeath(), knowledge_alchemy_attempt(), knowledge_display(), knowledge_do_attempt(), knowledge_do_display(), knowledge_give(), knowledge_item_can_be_used_alchemy(), knowledge_show(), knowledge_show_monster_detail(), knowledge_write_player_data(), lighter_type_apply(), list_players(), lock_item_cmd(), look_at(), magic_wall(), map_info(), mark_item_cmd(), meditate(), mimic_type_apply(), monster_can_see_enemy(), monster_communicate(), move_marker(), move_player_attack(), move_symptom(), paralyze_living(), party_help(), party_send_message(), perceive_self(), pets_follow_owner(), pets_move(), pets_move_golem(), pets_summon_golem(), pets_summon_object(), pick_lock(), pick_up(), pick_up_object(), player_attack_door(), player_lvl_adj(), plugins_display_list(), poison_living(), poison_type_apply(), poisoning_type_process(), potion_type_apply(), power_crystal_type_apply(), pray(), pray_at_altar(), prayer_failure(), prepare_weapon(), print_los(), probe(), put_object_in_sack(), quest_help(), quest_info(), quest_set_state(), quest_write_player_data(), receive_party_password(), receive_play_again(), receive_player_name(), receive_player_password(), recharge(), remove_curse(), remove_depletion(), remove_force(), save_player(), scroll_failure(), scroll_type_apply(), send_rules(), server_check_shutdown(), set_pickup_mode(), shop_describe(), shop_inventory_type_apply(), shop_mat_type_move_on(), show_commands(), show_matching_spells(), show_skills(), skill_attack(), skill_ident(), slow_living(), spell_failure(), spellbook_type_apply(), spring_trap(), tailor_god_spell(), trap_disarm(), trapdoor_type_move_on(), treasure_type_apply(), trigger_type_apply(), unapply_for_ob(), use_alchemy(), use_oratory(), weapon_improver_type_apply(), write_mark(), write_note(), write_on_item(), write_rune(), write_scroll(), and wrong_password(). Definition at line 3935 of file mapper.c. Referenced by action_makes_visible(), alchemy_failure_effect(), altar_type_move_on(), animate_weapon(), apply_builder_item(), apply_builder_remove(), apply_by_living(), apply_check_apply_restrictions(), apply_check_personalized_blessings(), apply_check_race_restrictions(), apply_container(), apply_savebed(), apply_special(), apply_update_ranged_skill(), arch_info(), attack_hth(), attack_message(), attack_ob_simple(), attempt_do_alchemy(), attempt_jump(), attempt_recipe(), attempt_steal(), basic_emote(), become_follower(), blind_living(), book_type_apply(), cast_bless(), cast_cause_disease(), cast_change_ability(), cast_consecrate(), cast_create_missile(), cast_curse(), cast_dust(), cast_identify(), cast_item_curse_or_curse(), cast_raise_dead_spell(), cast_smite_spell(), cast_spell(), change_abil(), change_spell(), check_login(), check_name(), check_pick(), check_sacrifice(), check_spell_expiry(), choose_cult_monster(), clock_type_apply(), command_abil(), command_addexp(), command_apply(), command_applymode(), command_arrest(), command_banish(), command_body(), command_bowmode(), command_cast_spell(), command_cointoss(), command_create(), command_debug(), command_drop(), command_examine(), command_follow(), command_forget_spell(), command_freeze(), command_goto(), command_help(), command_insert_into(), command_kick2(), command_kill_pets(), command_language(), command_learn_spell_or_prayer(), command_listen(), command_loadplugin(), command_loadtest(), command_lock_item(), command_mark(), command_nowiz(), command_party(), command_party_rejoin(), command_patch(), command_petmode(), command_pickup(), command_players(), command_quest(), command_remove(), command_rename_item(), command_reply(), command_reset(), command_resistances(), command_rskill(), command_search_items(), command_setgod(), command_settings(), command_showpets(), command_shutdown(), command_speed(), command_stack_list(), command_statistics(), command_stats(), command_strings(), command_style_map_info(), command_summon(), command_take(), command_teleport(), command_tell_all(), command_toggle_shout(), command_unarmed_skill(), command_unloadplugin(), command_use(), command_usekeys(), command_version(), command_whereabouts(), command_wimpy(), converter_type_move_on(), cure_disease(), current_map_info(), current_region_info(), deep_swamp_type_move_on(), deep_swamp_type_process(), display_new_pickup(), dm_stack_pop(), dm_stack_push(), do_forget_spell(), do_harvest(), do_learn_spell(), do_skill_attack(), do_tell(), do_throw(), do_turn(), do_wizard_hide(), dragon_ability_gain(), dragon_eat_flesh(), dragon_level_gain(), drop_object(), empty_container(), enter_exit(), enter_fixed_template_map(), enter_player_maplevel(), enter_unique_map(), examine(), execute_newserver_command(), exit_type_apply(), find_best_player_hth_skill(), find_key(), find_throw_ob(), fire_bow(), fire_misc_object(), follower_remove_given_items(), food_type_apply(), gate_type_process(), get_dm_object(), get_spell_by_name(), god_enchants_weapon(), god_examines_item(), god_examines_priest(), god_gives_present(), god_intervention(), hit_with_one_attacktype(), i18n_list_languages(), identify_altar_type_move_on(), identify_object_with_skill(), improve_weapon(), improve_weapon_stat(), inventory(), key_change_class(), key_confirm_quit(), key_roll_stat(), kill_object(), kill_player_not_permadeath(), knowledge_alchemy_attempt(), knowledge_display(), knowledge_do_display(), lamp_type_apply(), leave(), lighter_type_apply(), list_players(), look_at(), magic_wall(), malloc_info(), map_info(), mark_item_cmd(), monster_can_detect_enemy(), monster_communicate(), new_player_cmd(), party_form(), party_join(), party_leave(), peacemaker_type_process(), perceive_self(), pets_move_golem(), pets_summon_golem(), pets_summon_object(), pick_up(), player_attack_door(), plugins_display_list(), poison_living(), polymorph_melt(), potion_type_apply(), pray_at_altar(), prayer_failure(), prepare_weapon(), print_tod(), process_object(), process_players1(), push_ob(), put_object_in_sack(), quest_display(), quest_info(), quest_list(), quest_set_state(), quest_start(), recharge(), recursive_roll(), remove_force(), remove_special_prayers(), resurrect_player(), sack_can_hold(), save_life(), save_player(), save_throw_object(), scroll_type_apply(), sell_item(), send_news(), server_check_shutdown(), shop_describe(), shop_inventory_type_apply(), shop_pay_unpaid(), show_matching_spells(), show_skills(), singing(), skillscroll_type_apply(), spell_consume_items(), spellbook_type_apply(), swap_map(), swap_random_stats(), swap_stat(), time_info(), transmute_item_to_flower(), transport_type_apply(), trap_disarm(), trap_see(), treasure_type_apply(), unapply_for_ob(), unapply_special(), use_alchemy(), use_oratory(), use_skill(), worship_forbids_use(), write_note(), write_on_item(), write_rune(), and write_scroll(). Writes the list of unused maps, maps found in the directories but not linked from the other maps. Definition at line 3267 of file mapper.c. References found_maps, found_maps_count, root, and snprintf. 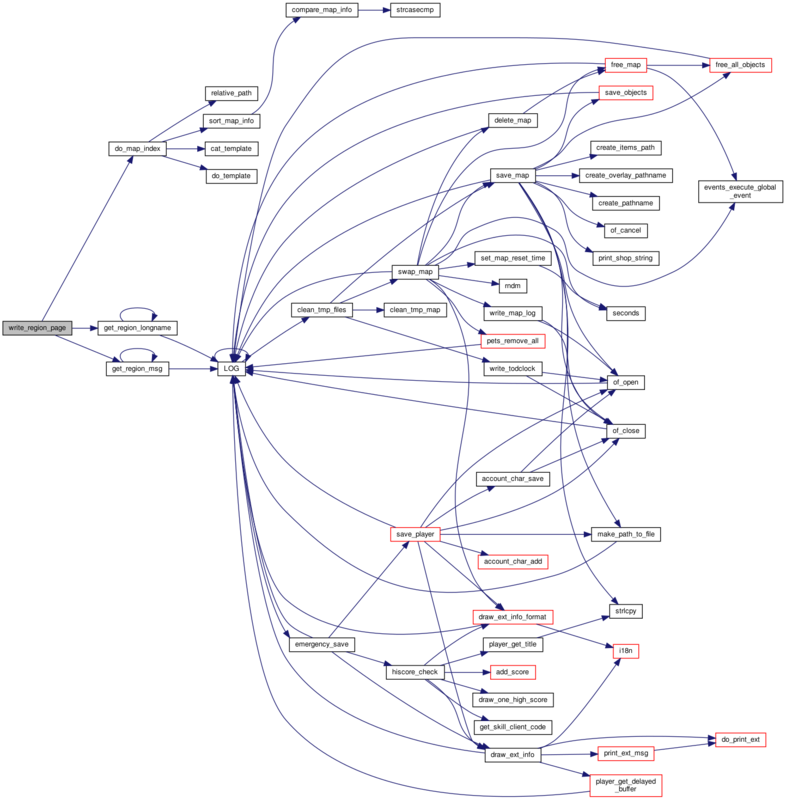 Definition at line 3950 of file mapper.c. Searches the item list for an identical item, except maps. item item to search. The variable may be freed, so must not be used after calling this function. item guaranteed to be unique in the item list. Definition at line 563 of file mapper.c. References struct_equipment::calc_power, struct_equipment::diff, equipment_allocated, equipment_count, free_equipment(), struct_equipment::name, and struct_equipment::power. Definition at line 3969 of file mapper.c. Referenced by object_remove(), and transmute_item_to_flower(). Definition at line 3956 of file mapper.c. Referenced by apply_container(), cast_detection(), dragon_ability_gain(), object_insert_in_ob(), and transmute_item_to_flower(). Definition at line 3972 of file mapper.c. Referenced by animate_weapon(), apply_container(), apply_race_and_class(), apply_special(), book_type_apply(), cancellation(), cast_identify(), cast_item_curse_or_curse(), cfapi_object_set_property(), command_dropall(), command_insert_into(), command_lock_item(), command_rename_item(), detect_curse_on_item(), detect_magic_on_item(), do_server(), drain_wand_charge(), drop_object(), empty_container(), god_enchants_weapon(), god_removes_curse(), hit_with_one_attacktype(), improve_armour(), improve_weapon(), improve_weapon_magic(), insert_objects(), key_change_class(), object_decrease_nrof(), object_increase_nrof(), object_update(), pick_up_object(), player_changer_type_process(), power_crystal_type_apply(), prepare_weapon(), put_object_in_sack(), remove_curse(), sell_item(), send_changed_object(), shop_pay_unpaid(), spellbook_type_apply(), unapply_special(), and weapon_improver_type_apply(). Definition at line 3975 of file mapper.c. Definition at line 3981 of file mapper.c. Referenced by apply_container(), apply_manual(), attack_ob_simple(), cftimer_process_event(), common_pre_ob_move_on(), do_throw(), drop_object(), hit_player(), hit_with_arrow(), kill_object(), kill_player(), move_teleporter(), object_free2(), pick_lock(), pick_up_object(), player_changer_type_process(), pray_at_altar(), process_object(), sell_item(), stop_projectile(), trigger_connected(), write_note(), and write_scroll(). Definition at line 3985 of file mapper.c. Referenced by apply_race_and_class(), apply_savebed(), check_login(), command_kick2(), command_tell_all(), command_toggle_shout(), do_tell(), enter_map(), flush_old_maps(), free_map(), key_change_class(), key_confirm_quit(), kill_object(), kill_player(), mapfile_load(), server_main(), and swap_map(). Definition at line 3943 of file mapper.c. Referenced by cfapi_map_message(), change_map_light(), command_me(), monster_do_say(), monster_do_talk_npc(), operate_altar(), and trigger_connected(). Recursively find all all maps in a directory. from path to search from, without trailing /. Definition at line 3222 of file mapper.c. References closedir(), dirent::d_name, Settings::datadir, found_maps, found_maps_allocated, found_maps_count, ignore_name, ignore_path, Settings::mapdir, opendir(), readdir(), S_ISDIR, settings, snprintf, and strdup(). Definition at line 3965 of file mapper.c. Referenced by cost_approx_str(), examine(), god_enchants_weapon(), monster_can_detect_enemy(), object_check_move_on(), price_approx(), and shop_price_buy(). Changes for the list all maps to the tiled map they are part of, if applicable. current map currently being processed. from list that contains the exits to/from map to be fixed. is_from if non zero, from is exit_from field, else it is an exit_to. Definition at line 2782 of file mapper.c. References add_map(), struct_map_list::count, struct_map_info::exits_from, struct_map_info::exits_to, struct_map_list::maps, and struct_map_info::tiled_group. Changes all exits to maps in a tiled map to point directly to the tiled map. Same for region lists. Definition at line 2801 of file mapper.c. References add_map(), struct_map_list::count, struct_map_info::exits_from, struct_map_info::exits_to, fix_exits_for_map(), struct_map_list::maps, struct_region_info::maps_list, region_count, and struct_map_info::tiled_group. Ensures all maps have a name (if there was a limit to map processing, some maps will have a NULL name which causes issues). Definition at line 2693 of file mapper.c. References struct_map_list::count, struct_map_info::filename, struct_map_list::maps, struct_map_info::name, and strdup(). Ensures all tiled maps have a name, a region, a filename and a path. Will try to find a suitable name and region from the maps in the group. use a better filename, try to get the start of the map filenames. Definition at line 2713 of file mapper.c. References struct_map_info::cfregion, struct_map_list::count, struct_map_info::filename, struct_map_list::maps, struct_npc_info::name, struct_map_info::name, regiondef::name, struct_map_info::path, snprintf, strdup(), and struct_map_info::tiled_maps. Makes all monsters point to tiled maps instead of map when appliable, and merge map monster to tiled map. Definition at line 2829 of file mapper.c. References add_map(), add_race_to_list(), struct_race_list::count, struct_map_list::count, struct_map_list::maps, struct_map_info::monsters, struct_race::origin, struct_race_list::races, and struct_map_info::tiled_group. Definition at line 549 of file mapper.c. Referenced by add_one_item(), and ensure_unique(). Gets the color for an elevation. elevation elevation to get color for. elevationmap picture that will get the color. Definition at line 825 of file mapper.c. Definition at line 536 of file mapper.c. Gets or creates if required the info structure for a map. Definition at line 1625 of file mapper.c. References add_map(), struct_map_list::count, create_map_info(), struct_map_info::filename, struct_map_list::maps, struct_map_info::path, and strdup(). 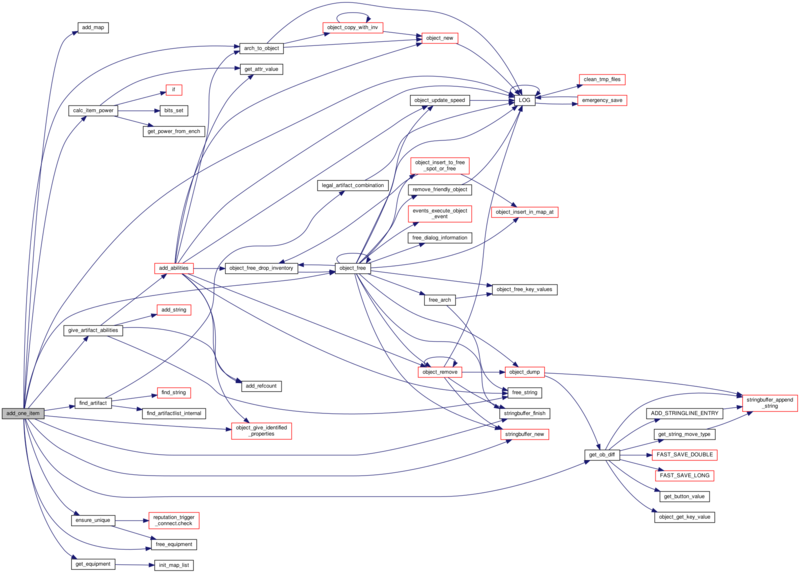 Referenced by do_parameters(), main(), CREMapInformationManager::process(), and process_map(). Gets the information for a quest, create the field if needed. Definition at line 1226 of file mapper.c. 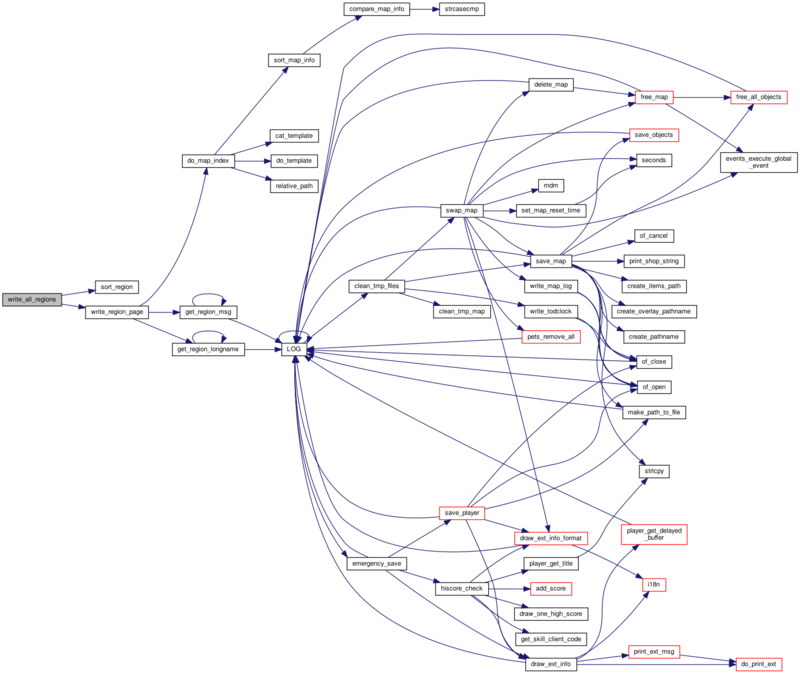 References init_struct_map_in_quest_list(), struct_quest::maps, struct_quest::name, struct_quest::number, quests_allocated, quests_count, and strdup(). Referenced by add_map_to_quest(), and define_quest(). Returns the race for specified name. Definition at line 711 of file mapper.c. References add_race_to_list(), struct_race_list::count, struct_race::count, init_map_list(), struct_race::name, struct_race::origin, struct_race_list::races, and strdup(). Returns a struct_slaying_info for specified slaying. Creates a new one if required. slaying value to get the structure of. structure for slaying. Never NULL. Definition at line 1775 of file mapper.c. References init_map_list(), struct_slaying_info::maps, S_MAX, struct_slaying_info::slaying, slaying_allocated, slaying_count, and strdup(). Definition at line 509 of file mapper.c. References add_map(), struct_map_list::allocated, struct_map_list::count, and struct_map_list::maps. Referenced by create_map_info(), get_equipment(), get_race(), get_slaying_struct(), and main(). Initialise a list of NPCs. Definition at line 1477 of file mapper.c. References struct_npc_list::allocated, struct_npc_list::count, and struct_npc_list::npc. 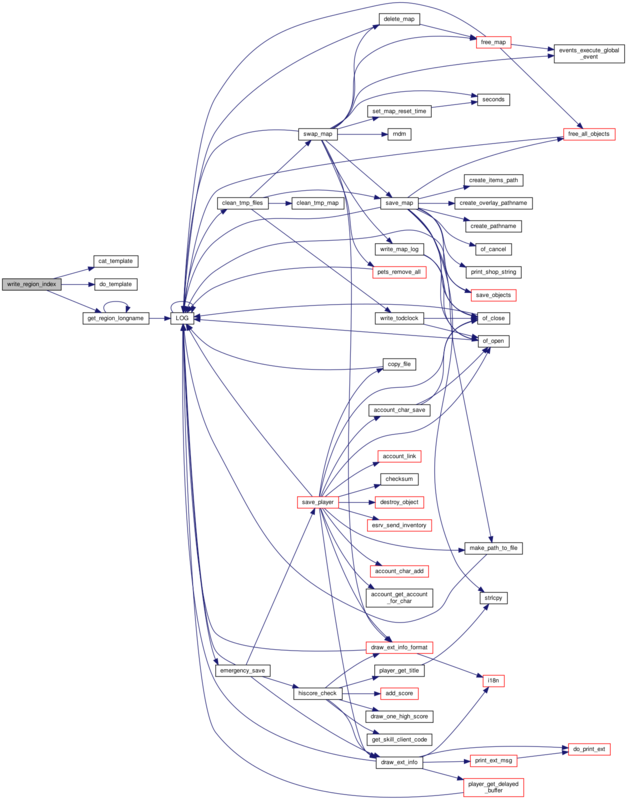 Definition at line 330 of file mapper.c. Referenced by create_map_info(), and main(). Definition at line 1204 of file mapper.c. Referenced by create_map_info(), and get_quest_info(). Checks if item blocks movement or not. 1 if item blocks all movement, 0 else. Definition at line 811 of file mapper.c. Checks if object is considered a road or not. 1 if object is a road, 0 else. Definition at line 775 of file mapper.c. References obj::arch, FLAG_IS_FLOOR, archt::name, and QUERY_FLAG. Is the slaying field relevant for this item? 1 if relevant, 0 else. Definition at line 1762 of file mapper.c. References CHECK_INV, CONTAINER, LOCKED_DOOR, SPECIAL_KEY, and obj::type. Definition at line 517 of file mapper.c. References AMULET, obj::arch, archt::clone, FLAG_NO_PICK, IS_ARMOR, IS_ARROW, IS_SHIELD, IS_WEAPON, MOVE_ALL, obj::move_block, obj::name, QUERY_FLAG, RING, ROD, obj::title, obj::type, and WAND. Marks specified path as processed. Definition at line 1653 of file mapper.c. Definition at line 3651 of file mapper.c. References cached_pics, color_blocking, color_linked_exit, color_road, color_slowing, color_unlinked_exit, struct_map_list::count, create_destination(), created_pics, Settings::debug, do_parameters(), do_regions_link, dump_unused_maps(), elevation_info, elevation_max, elevation_min, facesets, regiondef::fallback, find_maps(), first_map_path, first_region, fix_exits_to_tiled_maps(), fix_map_names(), fix_tiled_map(), fix_tiled_map_monsters(), force_pics, found_maps, found_maps_count, gdfaces, generate_index, generate_pics, get_map_info(), get_region_struct(), index_letter, index_map, index_quest_template, index_region_region_template, index_region_template, index_template, infomap, init_archetypes(), init_artifacts(), init_formulae(), init_globals(), init_gods(), init_library(), init_map_list(), init_race_list(), init_readable(), init_regions(), is_valid_faceset(), jpeg_quality, level_map_template, level_template, level_value_template, list_unused_maps, regiondef::longname, map_exit_template, map_exit_to_template, map_limit, map_lore_template, map_monster_after_template, map_monster_before_template, map_monster_between_template, map_monster_one_template, map_no_exit_template, map_no_exit_to_template, map_no_lore_template, map_no_monster_template, map_no_quest_template, map_one_quest_template, map_template, map_with_exit_template, map_with_exit_to_template, map_with_quests_template, struct_map_list::maps, regiondef::name, regiondef::next, nrofpixmaps, OF_JPG, output_extensions, output_format, pics_allocated, process_map(), quest_map_template, quest_template, rawmaps, read_client_images(), read_template(), region_letter_template, region_map_template, region_template, root, settings, show_maps, snprintf, sortbyname(), strdup_local, tileset, warn_no_path, world_exit_info, world_map, world_map_template, world_row_template, world_template, write_all_maps(), write_all_regions(), write_equipment_index(), write_maps_by_level(), write_maps_index(), write_npc_list(), write_quests_page(), write_race_index(), write_readable_list(), write_region_index(), write_regions_link(), write_slaying_info(), write_tiled_maps(), write_world_info(), write_world_map(), and yesno(). Referenced by ServiceCtrlHandler(), and ServiceMain(). Merge two tiled maps groups. This can happen if based on processing we do one map with tiled maps, another with tiled maps, and later figure out the tiles are actually linked. map the map that being processed has a tiling to a map in another group. Its group will be the final merging group. tiled_map the map tiled to another group. Its group will disappear. Definition at line 1591 of file mapper.c. References add_map(), struct_map_list::count, struct_map_list::maps, struct_map_info::tiled_group, and struct_map_info::tiled_maps. Definition at line 3947 of file mapper.c. Generates the map pictures (big and small), and exit information. Definition at line 1863 of file mapper.c. References add_map(), add_map_to_region(), add_monster(), add_npc_to_map(), add_region_link(), add_slaying(), BOOK, cached_pics, struct_map_info::cfregion, check_equipment(), check_slaying_inventory(), archt::clone, create_pathname(), create_tiled_map(), created_pics, face_info::data, delete_map(), mapdef::difficulty, do_auto_apply(), do_exit_map(), do_regions_link, EXIT, EXIT_PATH, struct_map_info::exits_from, struct_map_info::exits_to, face_sets::faces, facesets, struct_map_info::filename, find_archetype(), FLAG_FRIENDLY, FLAG_MONSTER, FLAG_UNAGGRESSIVE, FOR_MAP_FINISH, FOR_MAP_PREPARE, force_pics, gdfaces, generate_pics, get_face_fallback(), get_map_info(), get_region_by_map(), struct_map_info::height, mapdef::in_memory, is_slaying(), struct_map_info::level, list_map(), list_unused_maps, struct_map_info::lore, make_path_to_file(), MAP_HEIGHT, MAP_IN_MEMORY, MAP_WIDTH, mapdef::maplore, MAX_BUF, merge_tiled_maps(), obj::msg, struct_map_info::name, mapdef::name, struct_map_info::npcs, object_get_multi_size(), output_extensions, output_format, struct_map_info::path, mapdef::path, path_combine_and_normalize(), struct_map_info::pic_was_done, pics_allocated, PLAYER_CHANGER, process_map_lore(), QUERY_FLAG, rawmaps, struct_map_info::readable, ready_map_name(), mapdef::reset_time, root, save_picture(), show_maps, SIGN, size_small, snprintf, strdup(), TELEPORTER, mapdef::tile_path, struct_map_info::tiled_group, struct_map_info::tiled_maps, struct_map_info::tiles, tileset, warn_no_path, struct_map_info::width, struct_npc_info::x, and struct_npc_info::y.
Extracts from the map's lore quest information if found. May modify map->lore. Definition at line 1329 of file mapper.c. References add_map_to_quest(), define_quest(), struct_map_info::lore, and struct_npc_info::name. Reads a file in memory. name file path to read. buffer where to store. Can be left uninitialized in case of errors. will exit() with code 1 if any error occurs or if the file doesn't exist. Definition at line 927 of file mapper.c. Computes the shortest path from one file to another. result string that will contain the calculated path. Must be large enough, no test done. from and to must be absolute paths (starting with /). Definition at line 1047 of file mapper.c. Referenced by do_map_index(), and write_map_page(). Definition at line 3978 of file mapper.c. Saves a map to a file, based on jpg/png settings. file opened file to which to save. Definition at line 1710 of file mapper.c. References jpeg_quality, OF_PNG, and output_format. Referenced by do_tiled_map_picture(), process_map(), write_world_info(), and write_world_map(). Definition at line 3962 of file mapper.c. Sort 2 struct_equipment, first on item power then name. Definition at line 693 of file mapper.c. References struct_equipment::name, struct_equipment::power, and strcasecmp(). Sorts the struct_map_info according to the map name or the path if equal. Definition at line 1139 of file mapper.c. Referenced by do_map_index(), write_map_page(), and write_race_index(). Sorts the struct_map_info according to the map's level, and if equal the name or the path. Definition at line 1155 of file mapper.c. Sorts the strings according to the last part of the filename (after the last /). comparison on last element, and if equal then on whole string. 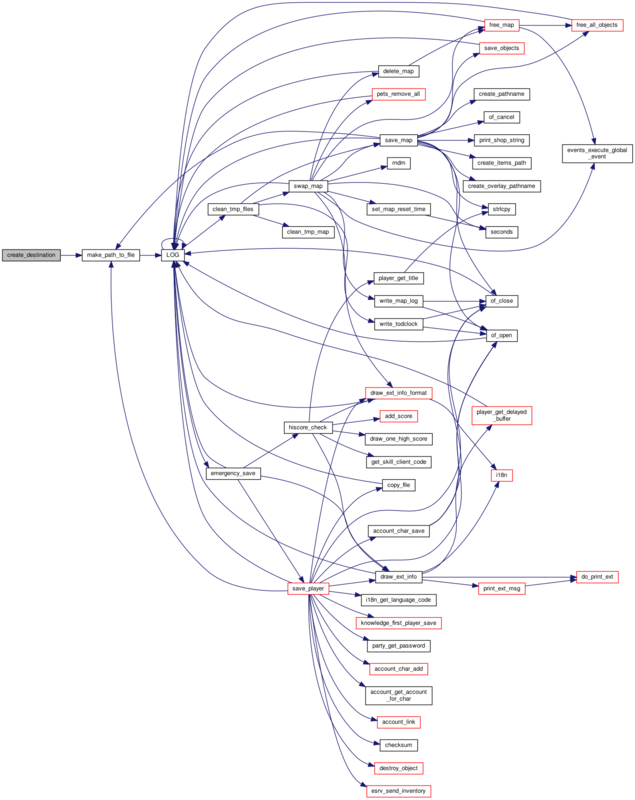 Definition at line 1086 of file mapper.c. Definition at line 762 of file mapper.c. Referenced by write_map_page(), and write_race_index(). Sorts an array of struct_region_info by region name. result of strcmp() for names. Definition at line 1174 of file mapper.c. Helper function to sort an array of struct_slaying_info. Definition at line 3408 of file mapper.c. Referenced by write_npc_list(), and write_slaying_info(). Sorts 2 struct_map_in_quest, on the map's name or path. Definition at line 1280 of file mapper.c. References struct_map_in_quest::map, struct_map_info::name, struct_map_info::path, strcasecmp(), and struct_map_info::tiled_group. Sort values alphabetically Used by qsort to sort values alphabetically. -1 if a is less than b, 0 if a equals b, 1 else. Definition at line 894 of file mapper.c. Definition at line 2869 of file mapper.c. 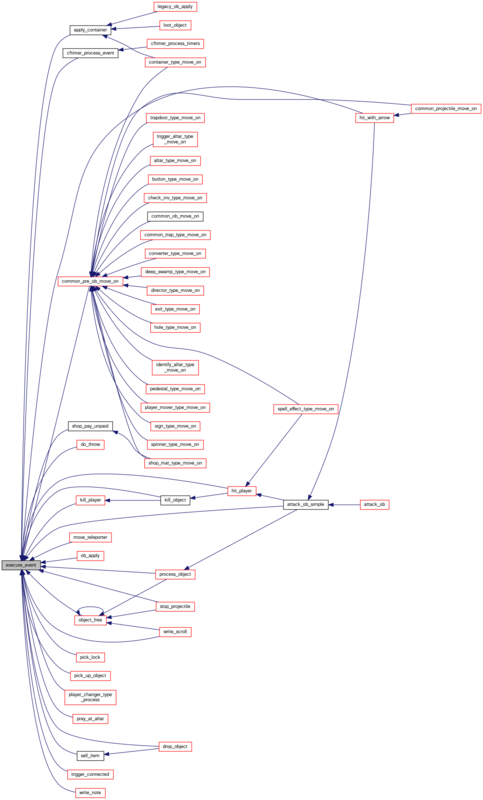 References struct_map_list::count, struct_map_list::maps, output_extensions, output_format, struct_map_info::path, struct_map_info::pic_was_done, root, snprintf, and struct_map_info::tiled_maps. Ensures all maps have a name, and writes all map pages. Definition at line 2857 of file mapper.c. References struct_map_list::count, struct_map_list::maps, struct_map_info::tiled_group, and write_map_page(). Generates all map indexes for a region. Definition at line 2300 of file mapper.c. References region_count, sort_region(), and write_region_page(). Definition at line 3132 of file mapper.c. References struct_map_list::count, equipment_count, struct_npc_info::name, struct_equipment::origin, root, snprintf, and sort_equipment(). map map to write page of. Definition at line 2521 of file mapper.c. References cat_template(), struct_map_info::cfregion, struct_race_list::count, struct_map_in_quest_list::count, struct_map_list::count, struct_map_in_quest::description, do_template(), struct_map_info::exits_from, struct_map_info::exits_to, struct_map_info::filename, get_region_longname(), struct_map_info::level, struct_map_in_quest_list::list, struct_map_info::lore, make_path_to_file(), map_exit_template, map_exit_to_template, map_lore_template, map_monster_after_template, map_monster_before_template, map_monster_between_template, map_monster_one_template, map_no_exit_template, map_no_exit_to_template, map_no_lore_template, map_no_monster_template, map_no_quest_template, map_one_quest_template, map_template, map_with_exit_template, map_with_exit_to_template, map_with_quests_template, struct_map_list::maps, struct_map_info::max_monster, struct_map_info::min_monster, struct_map_info::monsters, struct_map_info::name, regiondef::name, struct_race::name, struct_quest::name, struct_quest::number, output_extensions, output_format, struct_map_info::path, struct_map_in_quest::quest, struct_map_info::quests, quests, struct_race_list::races, relative_path(), root, snprintf, sort_map_info(), sort_race(), and strdup(). Referenced by write_all_maps(), and write_tiled_map_page(). Outputs the list of maps sorted by level. Definition at line 3054 of file mapper.c. References cat_template(), struct_map_list::count, do_template(), struct_map_info::level, level_map_template, level_template, level_value_template, struct_map_list::maps, struct_npc_info::name, struct_map_info::name, struct_map_info::path, root, snprintf, sort_map_info_by_level(), and struct_map_info::tiled_group. Generates global map index, file maps.html. Definition at line 2312 of file mapper.c. References do_map_index(), index_letter, index_map, index_template, and root. Write the list of all found NPCs in maps. Definition at line 3457 of file mapper.c. References struct_npc_list::count, struct_map_list::count, struct_map_list::maps, MAX_BUF, struct_npc_info::message, struct_npc_info::name, struct_npc_list::npc, struct_map_info::npcs, struct_map_info::path, root, slaying_count, snprintf, sort_slaying(), struct_npc_info::x, and struct_npc_info::y. Writes all maps of the specified slaying information. file file to write to. info slaying information to write. item which of the S_xxx to write. with text to write when there are maps to write. Mustn't be NULL. without text to write when there are no maps. Can be NULL. Definition at line 3377 of file mapper.c. References struct_map_list::count, struct_map_list::maps, struct_slaying_info::maps, sort_mapname(), and write_slaying_map_name(). Writes the global quests page. Definition at line 1402 of file mapper.c. References cat_template(), struct_map_in_quest_list::count, struct_map_in_quest::description, struct_quest::description, do_template(), index_quest_template, struct_map_in_quest_list::list, struct_quest::mainmap, struct_map_in_quest::map, struct_quest::maps, struct_map_info::name, struct_quest::name, quest_map_template, quest_template, quests_count, root, snprintf, sort_struct_map_in_quest(), and strdup(). Writes the monster information page. Definition at line 3165 of file mapper.c. 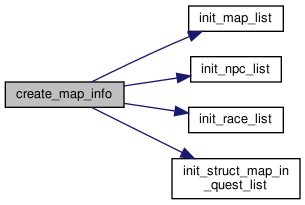 References struct_race_list::count, struct_map_list::count, struct_race::count, struct_map_list::maps, struct_npc_info::name, struct_race::name, struct_race::origin, struct_map_info::path, struct_race_list::races, root, snprintf, sort_map_info(), and sort_race(). Write the list of all found SIGN and BOOK in maps. Definition at line 3493 of file mapper.c. References struct_npc_list::count, struct_map_list::count, struct_map_list::maps, MAX_BUF, struct_npc_info::message, struct_npc_info::name, struct_npc_list::npc, struct_map_info::path, struct_map_info::readable, root, snprintf, struct_npc_info::x, and struct_npc_info::y. Definition at line 2334 of file mapper.c. References cat_template(), do_template(), get_region_longname(), index_region_region_template, index_region_template, regiondef::name, struct_region_info::reg, region_count, root, and snprintf. Generates the web page for a region. reg region/maps for which to generate. Definition at line 2267 of file mapper.c. References do_map_index(), get_region_longname(), get_region_msg(), struct_region_info::maps_list, regiondef::name, struct_region_info::reg, region_letter_template, region_map_template, region_template, and root. Write the .dot file representing links between regions. Definition at line 3332 of file mapper.c. References do_regions_link, MAX_BUF, regions_link, regions_link_count, root, and snprintf. Writes all slaying info to file. Definition at line 3418 of file mapper.c. 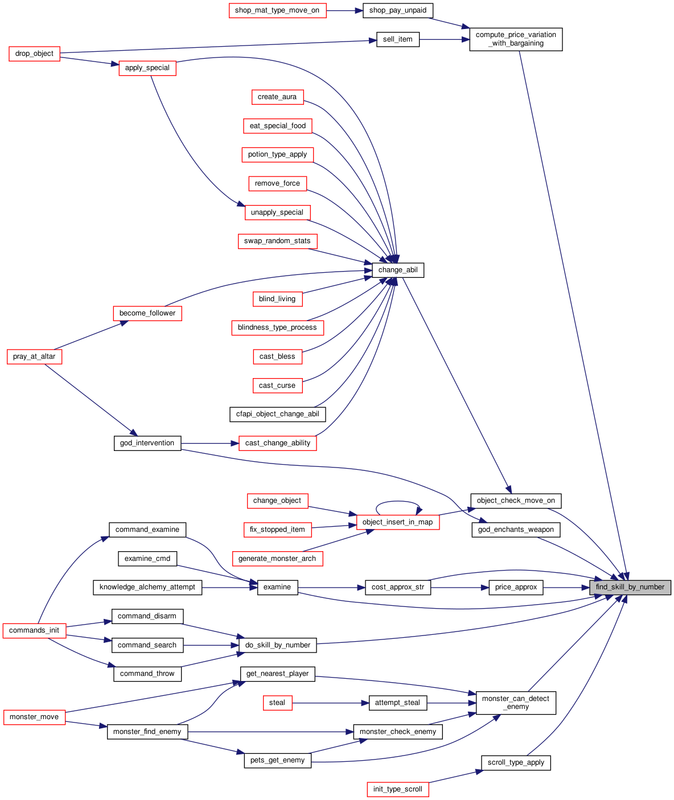 References struct_map_list::count, struct_slaying_info::maps, MAX_BUF, root, S_CONNECT, S_CONTAINER, S_DOOR, S_KEY, struct_slaying_info::slaying, slaying_count, snprintf, sort_slaying(), and write_one_slaying_info(). Helper function to write a map to a file with its link and full path. map map info to write. Definition at line 3359 of file mapper.c. References struct_map_info::name, struct_map_info::path, and struct_map_info::tiled_group. Writes the page for a tiled map group. : do a real page, with the various levels, maps and such. 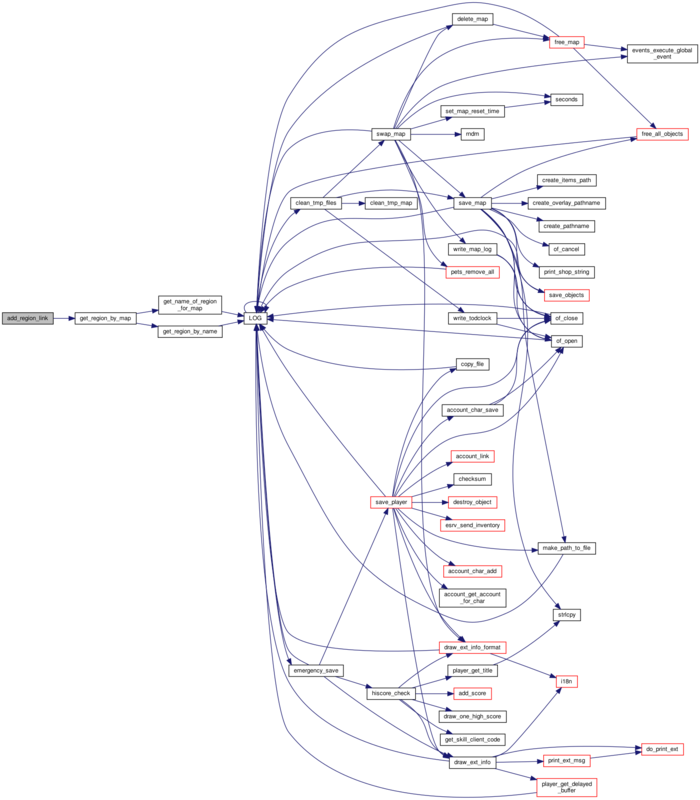 Definition at line 3032 of file mapper.c. Outputs all tiled map pages. Definition at line 3042 of file mapper.c. References struct_map_list::count, struct_map_list::maps, and write_tiled_map_page(). Writes the exit information world map. Definition at line 3290 of file mapper.c. References elevation_info, elevation_max, elevation_min, get_elevation_color(), infomap, MAX_BUF, output_extensions, output_format, root, save_picture(), snprintf, world_exit_info, struct_npc_info::x, and struct_npc_info::y.
Generates a big world map. Definition at line 2375 of file mapper.c. References cat_template(), do_template(), infomap, struct_npc_info::name, OF_PNG, output_extensions, output_format, region_allocated, root, save_picture(), SIZE, snprintf, struct_region_info::sum, struct_region_info::sum_x, struct_region_info::sum_y, world_map, world_map_template, world_row_template, world_template, struct_npc_info::x, and struct_npc_info::y. "no" if value == 0, "yes" else. Definition at line 3647 of file mapper.c. Definition at line 425 of file mapper.c. Referenced by main(), and process_map(). Definition at line 473 of file mapper.c. 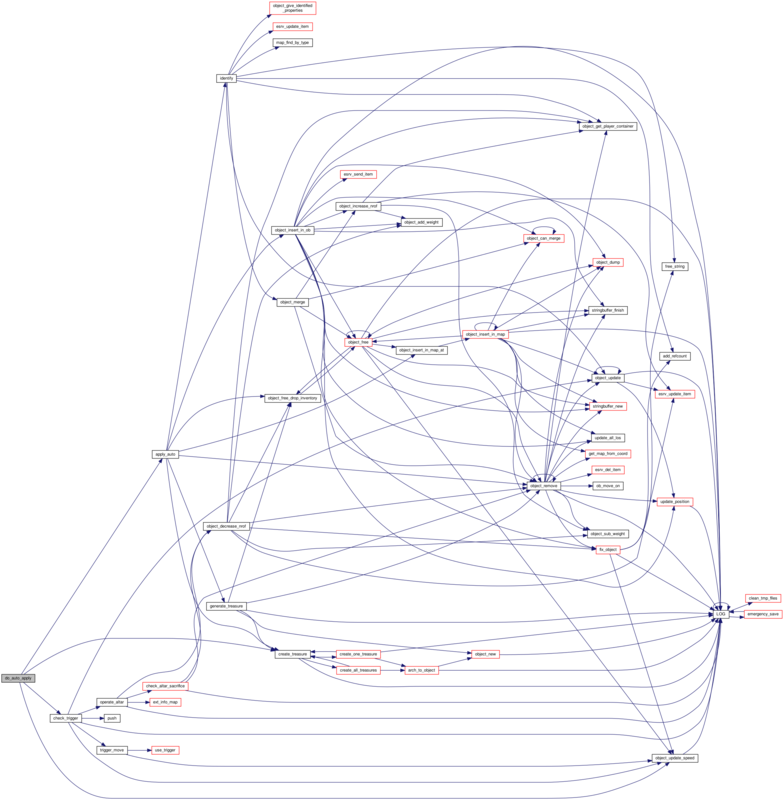 Referenced by do_exit_map(), and main(). Exit leading to another map. Definition at line 471 of file mapper.c. Definition at line 472 of file mapper.c. Definition at line 474 of file mapper.c. Color for exits without a path set. Definition at line 470 of file mapper.c. Picture statistics. Total created pics. Definition at line 424 of file mapper.c. Definition at line 481 of file mapper.c. 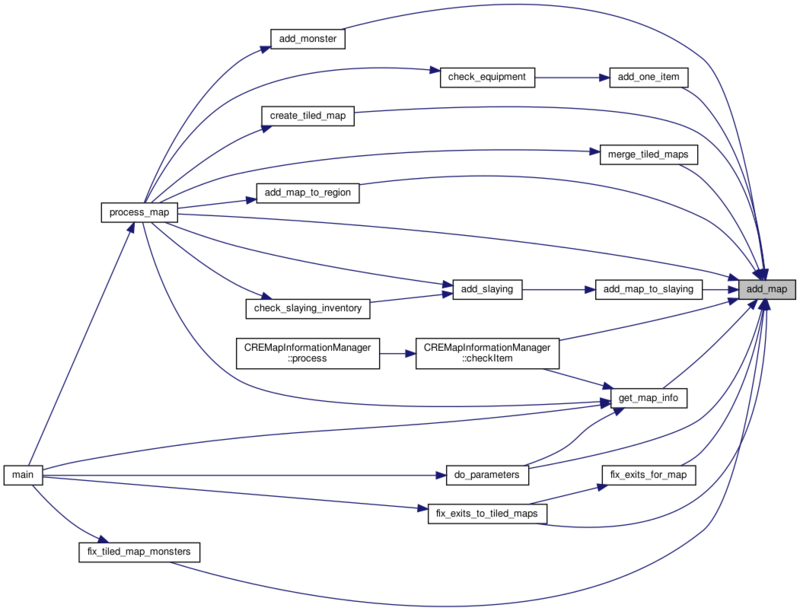 Referenced by do_parameters(), main(), CREMapInformationManager::process(), process_map(), and write_regions_link(). All elevation spots in the "world_" maps. Definition at line 476 of file mapper.c. Referenced by do_exit_map(), main(), and write_world_info(). Definition at line 478 of file mapper.c. Referenced by do_exit_map(), get_elevation_color(), main(), and write_world_info(). Definition at line 477 of file mapper.c. Definition at line 313 of file mapper.c. Number of items in special_equipment. Definition at line 311 of file mapper.c. Referenced by ensure_unique(), and write_equipment_index(). To force picture regeneration even if map didn't change. Definition at line 372 of file mapper.c. 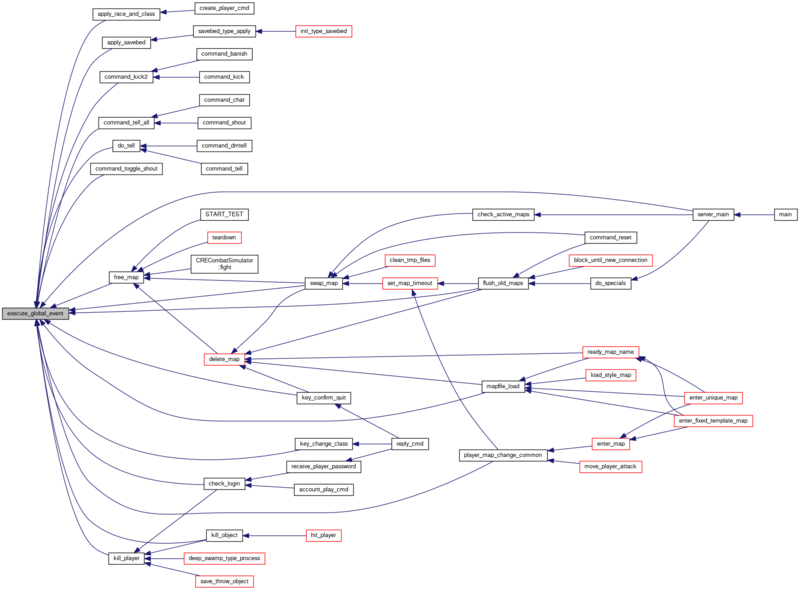 Referenced by do_parameters(), main(), and process_map(). Definition at line 464 of file mapper.c. Referenced by dump_unused_maps(), find_maps(), list_map(), and main(). Definition at line 466 of file mapper.c. Number of items in found_maps. Definition at line 465 of file mapper.c. Definition at line 232 of file mapper.c. Whether to do the map index or not. Definition at line 373 of file mapper.c. Referenced by do_map_index(), do_parameters(), and main(). Whether to generate the picture or not. Definition at line 371 of file mapper.c. 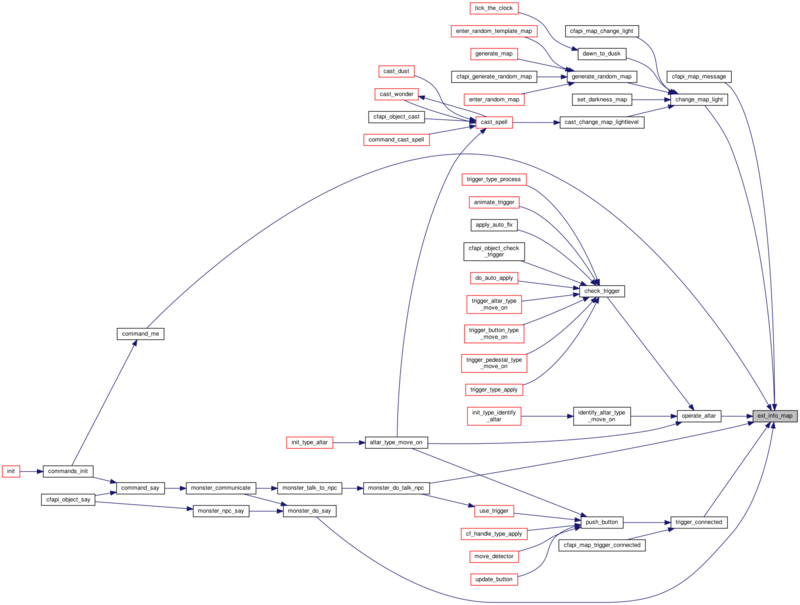 Referenced by do_parameters(), do_tiled_map_picture(), main(), and process_map(). File names to ignore for map search. Definition at line 3209 of file mapper.c. Directories to ignore for map search. Definition at line 3198 of file mapper.c. Index page template: one letter, including the maps it contains. Definition at line 401 of file mapper.c. Referenced by main(), and write_maps_index(). Index page template: one map. Definition at line 402 of file mapper.c. Definition at line 415 of file mapper.c. Referenced by main(), and write_quests_page(). One region in the region index template. Definition at line 409 of file mapper.c. Referenced by main(), and write_region_index(). Definition at line 408 of file mapper.c. Definition at line 400 of file mapper.c. Definition at line 469 of file mapper.c. Referenced by do_exit_map(), main(), write_world_info(), and write_world_map(). Definition at line 443 of file mapper.c. Referenced by do_parameters(), main(), and save_picture(). Definition at line 413 of file mapper.c. 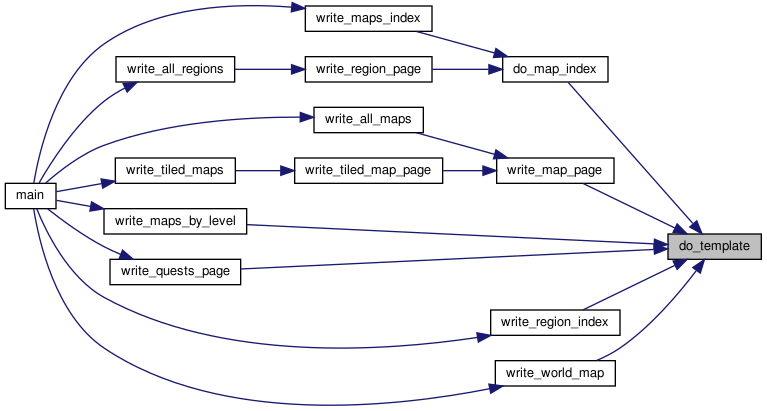 Referenced by main(), and write_maps_by_level(). Definition at line 411 of file mapper.c. Definition at line 412 of file mapper.c. If set, program will list maps found in directory but not linked from the first maps. Definition at line 463 of file mapper.c. Definition at line 388 of file mapper.c. Referenced by main(), and write_map_page(). Map template: one exit leading to this map. Definition at line 391 of file mapper.c. Maximum number of maps to browse, -1 for all. Definition at line 375 of file mapper.c. Referenced by do_parameters(), and main(). Definition at line 392 of file mapper.c. Map template: after the monster list. Definition at line 398 of file mapper.c. Map template: before the monster list. Definition at line 395 of file mapper.c. Map template: between each monster. Definition at line 396 of file mapper.c. Definition at line 397 of file mapper.c. World map template: no exit. Definition at line 386 of file mapper.c. World map template: no exit leading to this map. Definition at line 389 of file mapper.c. Definition at line 393 of file mapper.c. Definition at line 394 of file mapper.c. Definition at line 419 of file mapper.c. Definition at line 421 of file mapper.c. Definition at line 385 of file mapper.c. Definition at line 387 of file mapper.c. Map template: exits leading to this map. 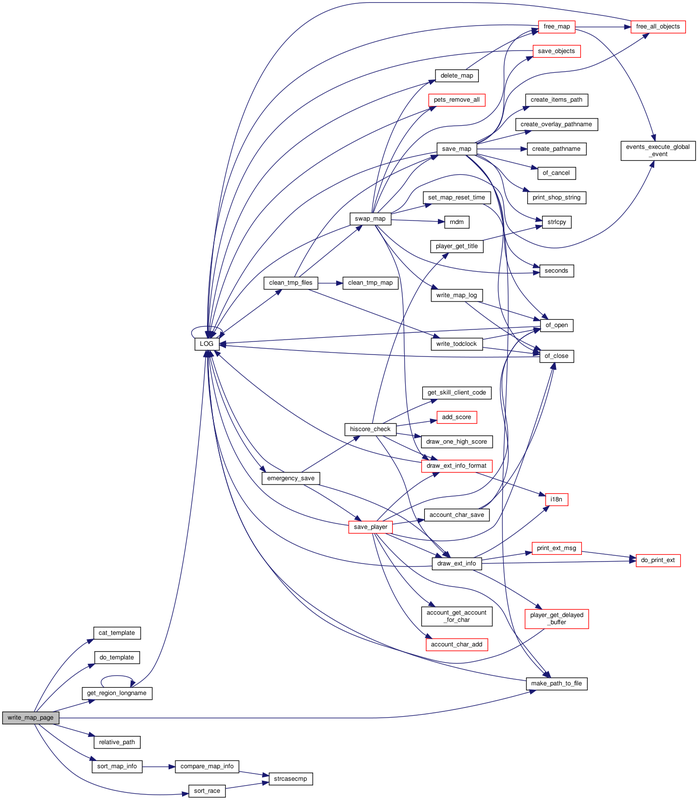 Definition at line 390 of file mapper.c. Definition at line 420 of file mapper.c. Maps to process or found. Definition at line 295 of file mapper.c. Extensions depending on output format. Definition at line 434 of file mapper.c. Referenced by do_tiled_map_picture(), main(), process_map(), tiled_map_need_pic(), write_map_page(), write_world_info(), and write_world_map(). Definition at line 440 of file mapper.c. Referenced by do_parameters(), do_tiled_map_picture(), main(), process_map(), save_picture(), tiled_map_need_pic(), write_map_page(), write_world_info(), and write_world_map(). Number of created pictures for GD. Definition at line 368 of file mapper.c. Definition at line 417 of file mapper.c. Definition at line 416 of file mapper.c. All quests in the game. Definition at line 1198 of file mapper.c. Definition at line 1202 of file mapper.c. 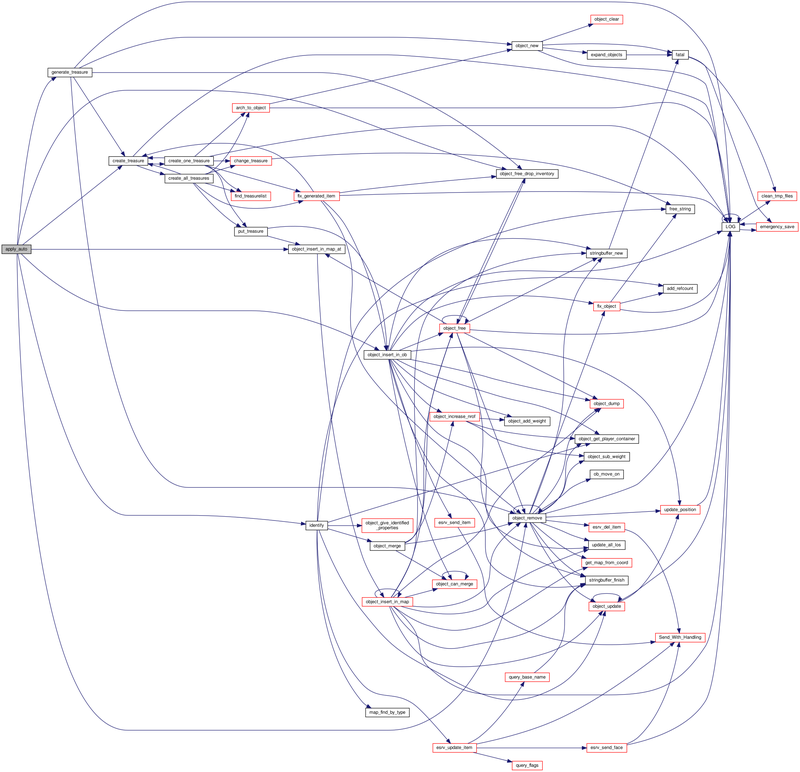 Definition at line 1200 of file mapper.c. Referenced by get_quest_info(), and write_quests_page(). Definition at line 323 of file mapper.c. Whether to generate raw pics or instancied ones. Definition at line 446 of file mapper.c. Definition at line 461 of file mapper.c. Definition at line 460 of file mapper.c. Referenced by add_map_to_region(), assign_region_parents(), fix_exits_to_tiled_maps(), write_all_regions(), and write_region_index(). One letter for the region. Definition at line 405 of file mapper.c. Referenced by main(), and write_region_page(). Region page template: one map. Definition at line 406 of file mapper.c. Definition at line 404 of file mapper.c. Definition at line 459 of file mapper.c. Definition at line 482 of file mapper.c. Referenced by add_region_link(), and write_regions_link(). Definition at line 484 of file mapper.c. Definition at line 483 of file mapper.c. Definition at line 365 of file mapper.c. Referenced by create_destination(), do_parameters(), do_tiled_map_picture(), dump_unused_maps(), CREResourcesWindow::fillArchetypes(), CREResourcesWindow::fillArtifacts(), CREResourcesWindow::fillFaces(), CREResourcesWindow::fillFormulae(), CREResourcesWindow::fillMaps(), CREResourcesWindow::fillMessages(), CREResourcesWindow::fillQuests(), CREResourcesWindow::fillRandomMaps(), CREResourcesWindow::fillScripts(), main(), process_map(), CREFacePanel::setItem(), CRETreasurePanel::setItem(), CREArchetypePanel::setItem(), CREAnimationPanel::setItem(), CREMessagePanel::setItem(), CREQuestPanel::setItem(), tiled_map_need_pic(), write_equipment_index(), write_map_page(), write_maps_by_level(), write_maps_index(), write_npc_list(), write_quests_page(), write_race_index(), write_readable_list(), write_region_index(), write_region_page(), write_regions_link(), write_slaying_info(), write_world_info(), and write_world_map(). If set, will generate much information on map loaded. Definition at line 376 of file mapper.c. Definition at line 374 of file mapper.c. Referenced by do_tiled_map_picture(), and process_map(). Definition at line 502 of file mapper.c. Count of items in slaying_info. Definition at line 501 of file mapper.c. Referenced by get_slaying_struct(), write_npc_list(), and write_slaying_info(). Definition at line 500 of file mapper.c. Definition at line 309 of file mapper.c. Definition at line 298 of file mapper.c. Tileset to use to generate pics. Definition at line 379 of file mapper.c. Definition at line 449 of file mapper.c. If set, will generate a world map of exits. Definition at line 378 of file mapper.c. Referenced by do_parameters(), main(), and write_world_info(). If set, will generate a world map. Definition at line 377 of file mapper.c. Referenced by do_parameters(), main(), and write_world_map(). One map in a row. Definition at line 383 of file mapper.c. Referenced by main(), and write_world_map(). One row in the world map. Definition at line 382 of file mapper.c. Definition at line 381 of file mapper.c.